So here I am at Gilley’s huge new location in Dallas. Gilley’s is the bar made famous in the movie Urban Cowboy. 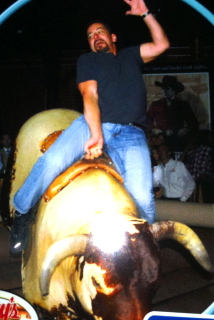 You’ll recall that Bud Davis, played by John Travolta, tries to impress his girlfriend Sissy, played by Debra Winger, with his (mechanical) bull-riding skills at Gilley’s. All four people are quickly dispatched. I’m up. I have friends watching and realize this ride could end up on YouTube. I quickly revise my prayer: “God, please don’t let me look too scared or stupid.” Then I enter the ring…. 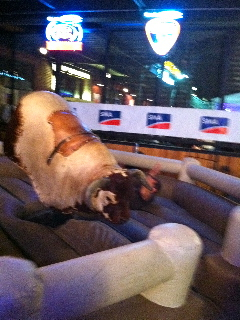 My 15 seconds of glory began with attempting to get on the bull — with a surprising amount of difficulty. You see, I thought I was too cool to simply climb on the mechanical beast. I was gonna just jump on it in one nimble move. I braced myself on the front and back of the seat area and attempted to jump. 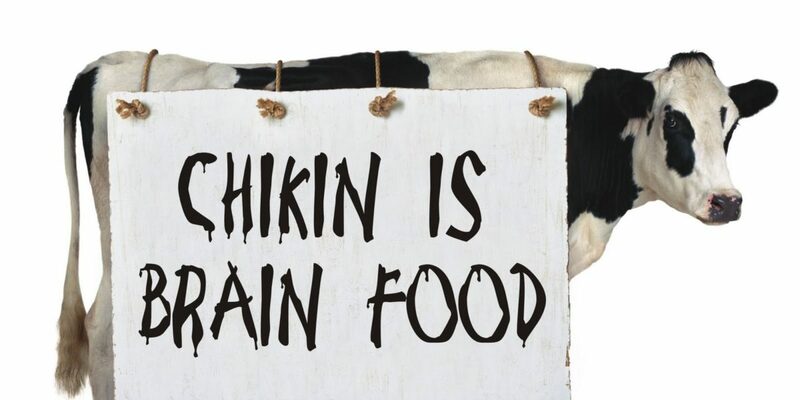 But the bull is surrounded by a raft-like air-filled padding on the floor that is at least 18 inches thick. 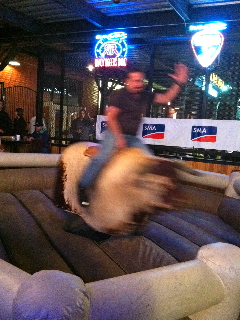 My pre-jump squat was meant to propel me onto the bull. 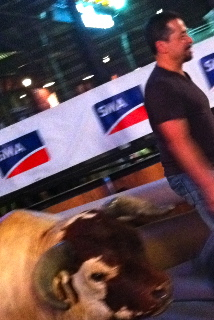 Instead I sunk knee deep and found myself staring at the side of the bull. 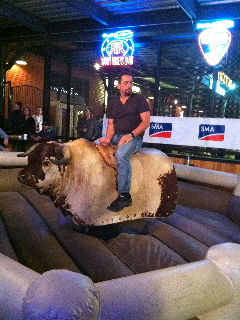 With a battered ego but lots of determination, I mounted in the conventional fashion. I went on to have a moderately successful ride. 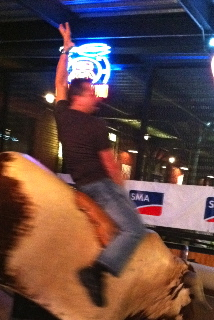 I’m sure this had more to do with an unspoken Gilley’s policy to make the tourist feel good rather than with my rodeo skills. Still, that ride and two follow-ups were the most fun I had sober in a long time. Speaking of sober, you’d almost expect to see a drunken brawl or two at Gilley’s if it were like the movies. But despite the enormous crowd of about 3,500 people, there were surprisingly few signs of over-indulgence — and no fights. Maybe it was because it was a Tuesday night. I’ll have to go back on a weekend and see what it’s like. I was with a group waiting outside our hotel for a taxi. We were heading out for the night and there were lots of people waiting in line for the next cab. When we got to the front of the line, we heard pounding dance music and saw something coming at us that had pulsing and laser lights shooting through its darkened windows. At first we thought it was a techno-rock alien spaceship. But it was in fact a cab whose owner had a marketing edge I’ve never seen before. He had retrofitted his standard taxi with a huge sound system, disco lights, karaoke microphones and more. And when the door opened and “stage smoke” rolled out, I knew this would be no ordinary taxi ride. What is your image of the “Dallas brand?” You may think redneck or JR Ewing, but once you visit, you think differently. 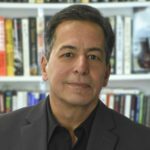 Dallas is a large, diverse city that has a big reputation to live up to. The city embodies the positioning that says “everything is big in Texas.” From the million-square-foot Convention Center to the enormous steaks at the popular restaurants, there is not much you’d call conservative — except maybe the politics. I saw so many examples of good product and service; I couldn’t help but be impressed by how this city and its people have reinvented and rebranded themselves since I was last there in the 80s. I can’t imagine that I would ever travel to Dallas for a vacation, but if I had to choose a city to do business in, Dallas would be in the top five. I never liked hearing the Cowboys called “America’s team” (everyone knows that’s the Browns!) — but Dallas is definitely is one of America’s best cities.